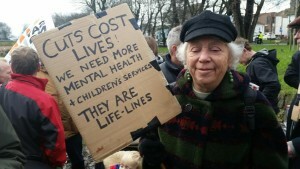 Brighton residents marched on a bitter January day to express their outrage about cuts to local government services. They are angry that Brighton and Hove City Council has been told to make £68 million of cuts across the city. Care centres for the disabled, including the mentally ill and elderly, children’s centres, special schools and children with special educational needs all continue to be under threat. 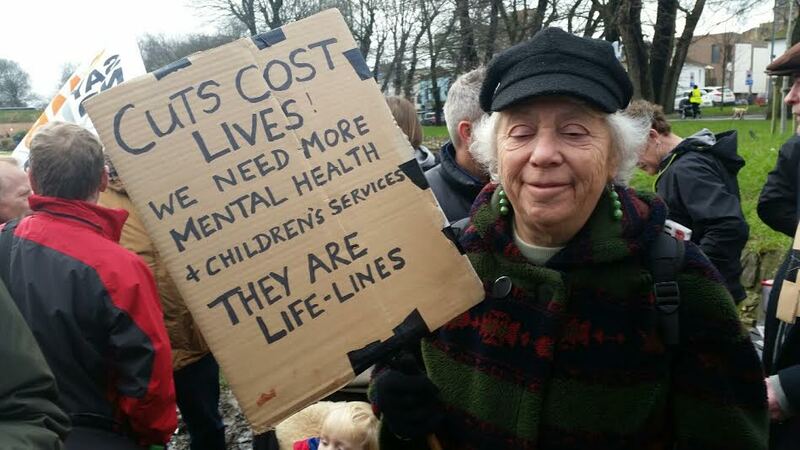 Margaret Hallan joined the march because her mother had dementia and there was simply not enough mental health services to support her when she became unwell. 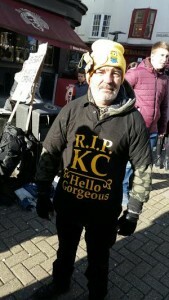 A GMB Union representative and Sussex Defend the NHS activist who works in the NHS marched in protest at a council tax rise of 4 per cent. He said: “It is the lowest paid who pay the highest price for the misdeeds of the upper classes and the rich. “Boots the chemist has moved its bank accounts offshore to the Cayman Islands to reduce their tax payments. “Democracy is government of the people by the people for the people. We have a government of the rich by the rich for the rich. He said that the British NHS was ranked the best in the world by the Commonwealth Fund while the system in the United States was only 11th. Allison Hooper marched in protest at the cuts because when she became mentally ill, she had to go to another area to get an in-patient bed in a psychiatric hospital. She said disabled people were now forced to go to job club for help with their job search, sometimes on a daily basis, after a capacity assessment at the benefits contractor Atos. This prevented them doing voluntary work. When Allison subsequently hurt her leg, she waited 24 hours before getting a bed at the Royal Sussex County Hospital. 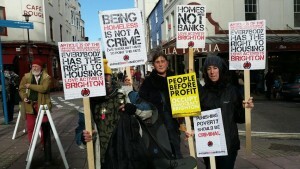 A protester called Ree led Love Activist Brighton protesters carrying banners saying: “Homelessness is not a crime.” And “Everybody has the right to housing”. A homeless man was wearing a sweatshirt made in memory of his friend KC who died on the streets over Christmas. The shortage of housing in Brighton and Hove is acute but Ree and her team are campaigning to get the council leader Warren Morgan to prioritise people with no home and to stop criminalising homeless people. Sue Beatty, who works for Unison at the council, said that the Labour leader Jeremy Corbyn wrote to all Labour councils urging them not to set illegal budgets. Paul Shellard, a specialist teacher employed by the council and NUT representative, addressed the rally. He was marching to protest about the consultation proposal to reduce the support for special educational needs children by 30 per cent to 50 per cent. Teachers will have to sign new generic contracts and will lose their teachers’ terms and conditions. Mr Shellard said: “It is not a supportive service for users or teachers who work longer hours and outside their specialisms.” He criticised the council for focusing on statutory services instead of prevention. Green councillor Phélim MacCafferty laid the blame at the government’s door. He said: “The economy has barely grown, the country’s credit rating is about to be downgraded and I’m not alone believing that we are facing another crash. “What a shame we can’t downgrade Chancellor George Osborne from useless to utterly useless. Organisations represented at the Stop the Cuts protest included the GMB, Unison, the NUT, supporting the specialist teachers of children with additional needs. Other organisations included Palestine Solidarity, the Green Party and Sussex LRC. Stop the Cuts is a movement that originated in Australia. An excellent range of groups, unions and local people affected by the cuts. It was good to see the Green Party and local Labour members side by side. A Shame no official showing from Brighton District Labour Party and not a single Labour Councillor. I don’t think Brighton voted Labour for Council to have them impose Tory Cuts. JC can say what he likes to try to stave off a coup by the PLP but it is residents who have to stand up to the Tories AND the Council! Yes you would have thought Cllr Emma H Daniel would have been there as She is involved with The Fairness Commission and Chair of the The Neighbour hoods Committee. She did find the time to go to Calais thoough,time to help locals first or has She got a hidden agenda?